Home > Love Your Home > Spring is here!!! Spring is here, with lighter evenings and fresh new blooms (can't wait for summer). OUR NEW STOCK is arriving and we are very excited and busy trying to get them ready for you. After six solid months of designing and planning our new website and many sleepless nights entering all the details, we want to thank you all for such a great response to it. Your kind comments and support over the last couple of very busy months, has made it all worth while. This year should be quite a challenge too. We are hoping to launch into a wider range of furniture - from country classic to French chic, for the living room, kitchen, dining room, bedroom and childrens' bedroom, which we are sure you are going to love. Our Garden Furniture range has been extended this year, with the addition of NEW gorgeous Cream 2 seat and 4 seat sets. 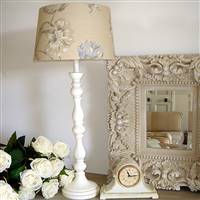 We shall also be including more NEW home accessories - Mirrors, Photo Frames, Lamps & Shades, Shelving and a beautiful Cream Dinner Set, very French!!! So please keep checking to see all the goodies we have instore for you, as they are arriving weekly.